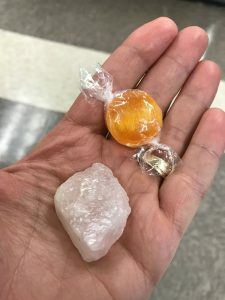 A butterscotch candy and geode may not seem to be that big of a deal unless a third grader gave them to you right after doing a mindfulness exercise on generosity. I have joined another elementary classroom for weekly mindfulness practice and I continue to see and hear how it is making a positive impact in their lives. Today we began our session by discussing how they had used their mindfulness “superpowers” over Thanksgiving break. Many hands went up and students told me how they used their anchor breathing to fall asleep at night and how they were mindful of their negative emotions when interacting with a sibling so they chose to walk away rather than yell or hit. Our exercise for the day was focused on generosity and how it makes us feel. I had them close their eyes as I read different scenarios where they imagined doing something nice for another person and then how that felt. One of my favorite descriptions from a student of how giving feels went like this, “Giving feels like when you take a loaf of fresh banana bread out of the oven”. I could not of described it any better! Going to our elementary to do mindfulness with different classes takes time. Today it was especially cold going to and from my car. However, sharing mindfulness with my elementary friends and their teachers makes my heart feel like it is bursting with joy. In giving I am the one who is receiving the most. My challenge for you this week is to look for ways to be generous. It doesn’t take money, smiles and high fives are free. All it takes is love and concern for your fellow human. I know twenty-five nine and ten year olds who can model it for you! Originally Shared by Meg Frideres on the Nevada Individualized PD Blog.